Hole By Hole samples some of my best pieces to appear in The Cape Gazette and at HoleByHole.com. Winner of First Place Award, Non-Fiction Books-Adult 2019 by The Delaware Press Association! 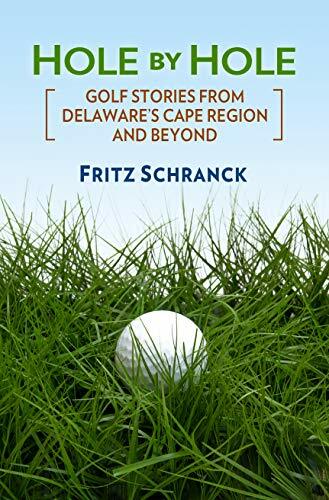 “Schranck has presented the public with an outstanding scrapbook of highlight columns collected from his work in the book, “Hole by Hole – Golf Stories from Delaware’s Cape Region and Beyond”. To be sure, the book is chock full of information on the area’s local golf scene. But it’s that and a whole lot more. The author has taken a snapshot of the goings on and happenings of the region and the golf scene in general…. 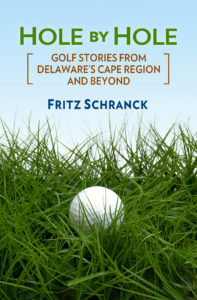 Schranck provides a special insight into the game with a local flair.” Bob Oliver, Golf Bucks County.com. “‘Hole By Hole’ is a rich trove of engaging and accessible writing that anyone can appreciate – whether or not they like or play golf.” Dennis Forney, Publisher, The Cape Gazette. “In Hole By Hole … Fritz has collected some of his favorite columns in a highly readable paperback edition.” Richard Forsten, Delaware State Bar Association July/August 2018 Bar Journal. Delaware’s Cape Region is a major golf attraction for locals and for the thousands of golfers who come to Delaware’s beaches from New York, Pennsylvania, New Jersey, Maryland, and DC. The columns highlight a vibrant golf community and the courses and personalities that make the Cape Region a destination golf location. For some readers, this collection is a bit like a scrapbook of their own golf memories. For others, it provides a glimpse of a part of golf not often seen in the pages of national publications – but an enjoyable stroll in a friendly neighborhood nonetheless. Hole By Hole is a collection of some of the best pieces to appear in his column. Like the column, the book samples a wide variety of golfing topics, featuring dozens of Cape Region golfers as well as members of the national and worldwide golf scene, such as Jack Nicklaus and Dame Laura Davies.